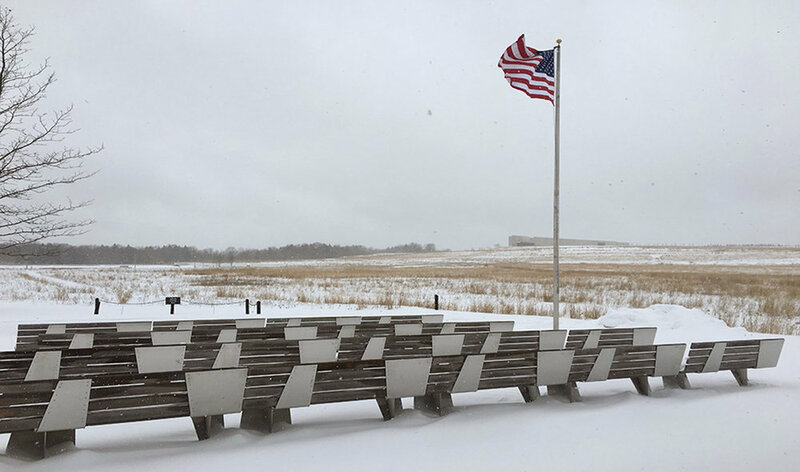 The chimes represent the key component of the nearly 100-foot-tall Tower of Voices, the final installation of the Flight 93 National Memorial, a 2,200-acre park located on a former reclaimed strip mine in Somerset County, Pa. It is where United Airlines Flight 93, bound for San Francisco from Newark, N.J. crashed, killing everyone on board. "It's the memory of these people, through these ephemeral voices from the chimes, actived by the wind," says architect Paul Murdoch; his firm's design was chosen from more than 1,000 concepts to design the memorial. Murdoch, a Pennsylvania native who grew up camping and canoeing in the area, won an international competition in 2005 to design the phased memorial. The chimes’ echoes evoke the final phone calls and voicemails those aboard made to loved ones. Before crashing, passengers and crew fought off terrorists believed to be targeting the U.S. Capitol. Murdoch, who grew up in Newtown Square, Pennsylvania, says that incorporating the power of the landscape - the vista of trees, the expanse of the field, the quiet beauty of the Pennsylvania countryside - is what makes the memorial different than traditionally designed memory spaces. Murdoch, 61, said his local upbringing — he's an alum of Marple Newtown High School in Newtown Square — influenced his design strategy. "Before I was interested in architecture, I had an appreciation for the landscapes in Pennsylvania," he said, and that translated "directly to the memorial of Flight 93." The Los Angeles County Board of Supervisors recently voted to fund the construction of the first phase of a new master plan by AHBE Landscape Architects and a new community event center designed by Paul Murdoch Architects that aims to transform Magic Johnson Park in South Los Angeles. Construction is winding down on the final feature in the Flight 93 National Memorial in Pennsylvania’s Somerset County. All that remains is to install an enormous, complicated set of wind chimes. Architect Paul Murdoch, who first pitched his plan for the memorial more than 13 years ago, has been incrementally building features since then. "This is probably the most challenging and the most unique piece," Murdoch said. "Had we tried it day one, I'm not sure we could have done it." It became an international project, with wind engineers from Colorado and Australia, a musician from upstate New York, and structural engineers from California and London. They had to do complicated analyses of wind patterns to make sure the chimes would sound alright, and repeatedly returned to the drawing board while figuring out how they'd swing. Murdoch said it's all worth it. "What these 40 people did, I think inspires service in a lot of us," he said. "And I think it's a very important place for Americans to see." The sound will add a new level of expression to the Memorial, Mr. Murdoch said. “Some visitors really might respond to the sound of the chimes; others might respond more to touching the names [at the crash site],” he said. Although the chimes range in size from five to ten feet, Murdoch says visitors will be able to see the tower before they can hear it. Paul Murdoch, Founder and President of Paul Murdoch Architects, joined Robert Mangino to talk about the final piece of the Flight 93 National Memorial known as the “Tower of Voices.” The memorial will be made public on September 9th just in time for the 17th anniversary of 9/11. Paul Murdoch shared his inspiration for the design and what will go into its construction. Using musical tuning theory, the team identified distinct tones for each chime, so that, when the wind strikes, the chimes will create a “conversation” of 40 unique voices. This meant understanding the wind direction and speed at the site, and how this would affect the sound--to figure it out, the team made recordings of chime mock-ups, used computational fluid dynamic modeling to look at potential tower shapes, tested chime configurations via acoustic simulations and used a wind tunnel to simulate conditions at the site. In winter, the wind can drive in at speeds up to 40 miles an hour, while other times of year bring much milder conditions. Murdoch and his team needed to test them all. Murdoch and his teams have been working on the project with the National Park Service for 12 years, phasing in the landscape design and visitors center first. The tower is the crowning achievement on a number of levels. Just like the 40 passengers and crew members aboard Flight 93. John Bernstiel, a national parks service ranger who manages the Flight 93 Memorial added, “Coal was mined here for the better part of 40 years. “Certain steps have to be taken to reclaim or heal the land after the mining is finished. This process can take decades. “Paul Murdoch, the architect of the memorial, working with his firm and landscape architect, decided that he wanted to directly incorporate this reclamation process into his design. “He did this through natural elements, such as our wetlands and 40 memorial groves, and also through the planned reforestation project, now in its seventh year. “We also needed a type of structural engineer who deals with moving mechanisms and dynamic forces, because the chime mechanism is our biggest technical challenge to work out,” Murdoch says. The tower’s meant to be ever-changing with natural forces, and a one-of-kind experience for visitors at any time of day or season. There are different moods from different conditions on site.